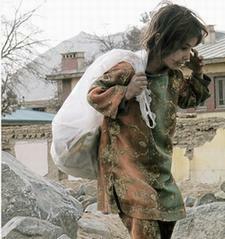 KABUL, Afghanistan, January 24, 2011 (ENS) – Mohammad Aref and his family are not looking forward to the Kabul summer. Last year, it meant stifling months shut up in the family home in the Khair Khana district, trying to avoid the fetid smell wafting in from the piles of rubbish in the surrounding streets. Although there are neighborhood rubbish bins, Aref complained that they were so large and unwieldy that people cannot fill them with rubbish, and the municipality does not empty them on time. This means that foul-smelling heaps of rubbish continually pile up on every corner, attracting flies and vermin. 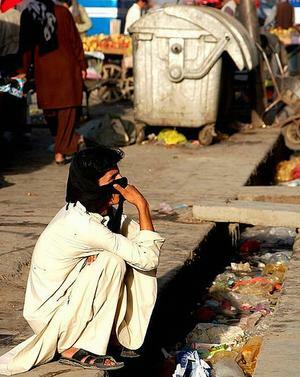 His concerns are shared by many Kabul residents and public health officials, who complain that illegal rubbish dumping and inefficient waste disposal systems are leading to an environmental crisis in this overcrowded city. 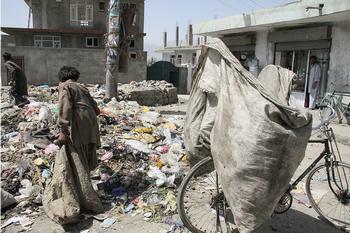 The public health department calculates that Kabul’s residents produce some 3,500 metric tonnes of rubbish daily. Around 3,000 containers are placed around the city to collect waste, which is then gathered and transported to the Gazak area, 30 kilometers (20 miles) away, for burial. But the current system cannot cope with the needs of the city’s five million inhabitants; its population swollen by migrants from Afghan provinces seeking better security and employment prospects. According to governmental officials, more than 60 percent of the houses in Kabul are illegal, adding to the problem of rubbish disposal. It’s not just that the heaps of waste blocking streets and alleyways are unsightly and emit a rank smell. The problem is leading to serious public health problems, experts say. “Rubbish is an environmental hazard, because when it mixes with the dust and wind it spreads diseases such as skin infections and diarrhea,” said Zemarai Haseen, who specializes in pediatric medicine at Kabul University’s medical school. Pools of stagnant water harbor mosquitoes, which can lead to outbreaks of malaria. The uncollected waste also allows sand flies, which spread leishmaniasis, to thrive. Kabul’s residents and the local authorities disagree over who is to blame for the deteriorating situation. Nesar Ahmad Habibi Ghori, director of the cleaning department of Kabul municipality, said residents had refused to work together with the authorities to keep the city clean. Instead, he said, they simply dumped their waste outside their homes and premises. Najibullah, a shopkeeper in Kabul city, admitted that he did indeed leave his rubbish outside his shop, arguing that this was only because the municipality had not provided enough bins. Others say that the international forces have also contributed to pollution in the city. A number of complaints from both locals and officials have arisen over the dumping of waste in the Hudkhel and Pol-e Charkhi areas of Kabul, some 10 kilometers (6.5 miles) from the city center. Abdulghani, a Hudkhel shopkeeper, said that vehicles transporting the contents of septic tanks from coalition bases have been known to empty their loads near local people’s houses. Habibi Ghori said his department had complained to the NATO-led security mission, ISAF, and even asked the Ministry of Defence and the Council of Ministers to intervene to prevent the foreign forces from unloading their solid and liquid waste in prohibited areas. An ISAF press officer said in response that contractors they employed to dispose of waste may have violated some conditions of the agreement and that they were investigating. “The [international] forces care about the environment and try to eliminate waste using special methods,” the press officer said, adding that spot checks had been ordered on the contractors to ensure they were carrying out their work in accordance with proper practice. 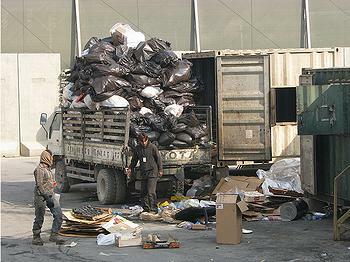 Meanwhile, the Kabul municipality said that they lack sufficient capacity to deal with the city’s rubbish problems. To this end, he said that his department is conducting a trial scheme in a number of neighborhoods in which they provided households with plastic bags to collect their waste, paying them 10 US cents for each full bag as an incentive.